He gives many concerts each year and for 50 years he has been involved in an extraordinary number of recording projects both as pianist and composer and has been at the forefront of music education in Australia via various tertiary institutions in Melbourne and throughout Australia. His performances cover a wide range. He has accompanied such eminent jazz musicians as Clark Terry, Mark Murphy and Ernestine Anderson and has been a supporting artist to Dave Brubeck, Oscar Peterson, Sarah Vaughan, Jean Luc Ponty, Ray Brown, the Art Ensemble of Chicago and many other distinguished groups. Yet he is equally at home playing Bach and Mozart and has been a guest soloist with both the Melbourne Symphony Orchestra and the Elizabethan Melbourne Orchestra. He has recorded on over twenty commercially released CDs, through Move Records and he regularly records for the ABC. Over the past few years, Tony has become increasingly active as a composer. Tony is a respected music writer and critic, and has won numerous awards for his distinguished artistry and committment to Australian Music. 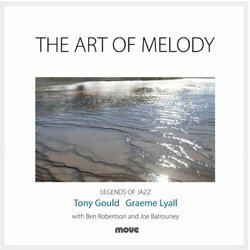 From the 1936 film Swing Time, Tony Gould and Graeme Lyall bring so much sentiment to this classic love song. Tony takes this standard and moves it toward a Classical flavour, but the overall Jazz tones also set it apart from the pack. A darling of a composition, played with unmatched tenderness!